To flash gionee S6s using SP Flash Tool and other tools like MTK VCOM USB drivers etc Proceed below. 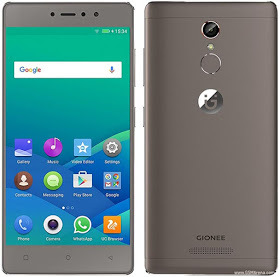 How to flash your gionee S6s device using an SP Flash Tool. Flashing your device requires your maximum carefulness in Following the steps here. So Techbmc will not be hold responsible if anything happens at the cause of Doing that. You are flashing at your own risk..
(thereby causing it not to power on, or won't be able charge and will not be detected by a computer) Avoid that totally. Download, MTK VCOM USB drivers.For more details on how to use the MTK VCOM USB drivers when flashing your device, click here. Download, latest SP Flash Tool. And for expert guide on how to use the tool, click here. First, launch Flashtool inside the extracted folder. Then click on where you seen scatter loader button. Next, select the scatter file inside the stock ROM folder of the device (gionee s6s pro) you wish to flash. Switch off your device and connect it to your PC. then you might need to factory reset device from recovery after flash.